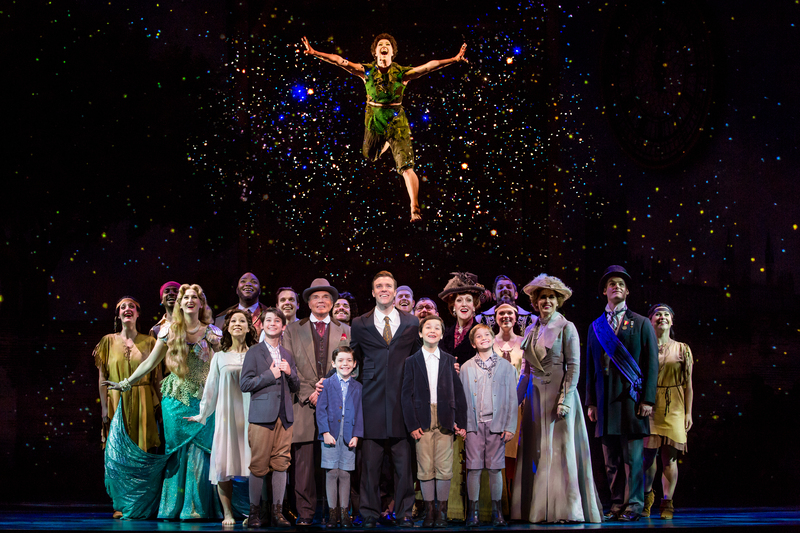 BOSTON – “Finding Neverland” could have been – maybe should have been – a great musical. After all, the work that is at the heart of the piece – J.M. Barrie’s classic “Peter Pan” – inspired many a production, including a hit animated Disney movie and a Broadway musical that has been revived many times and itself begat a TV version of the musical that became an iconic annual event. 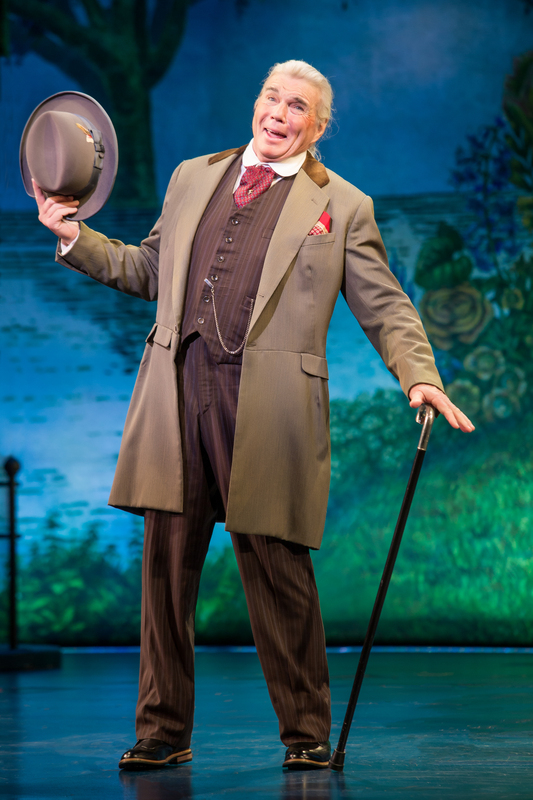 The national touring production of “Finding Neverland” now at the Boston Opera House is a handsome show to behold, has a good heart, a passel of laughs, engaging characters and a story to tell. If only there were 2-3 songs in the score you could really hang your hat on. The kind of songs Walt Disney was able to find for his animated film “Peter Pan” and Moose Charlap et al were able to write for the stage musical. They just aren’t there, and after productions in London, Cambridge, Broadway and now on tour, they may never be there. And just as “Peter Pan” has very dark undertones, this “Neverland” also has dark overtones and is also about loss – a loss of childhood innocence and unlike Peter Pan, a need to grow up so very suddenly, when illness and death intrude. 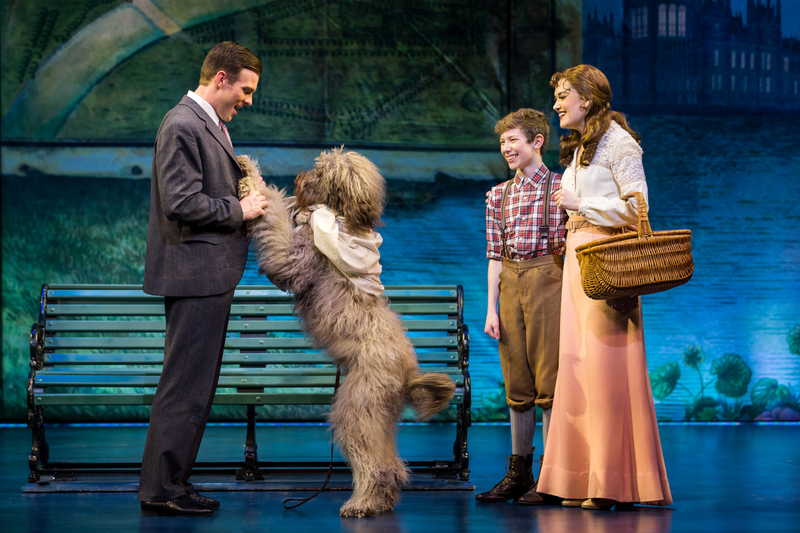 This is a tighter and more focused production than the show that ran at the American Repertory Theatre in 2014, and one of those rare occasions when the book of a musical outshines both the score and the choreography. So while the book by James Graham does the trick, alas, the score by Gary Barlow and Eliot Kennedy – even in this re-tooled production – never really rises above pleasant, with the best of the lot “Neverland,” “Believe” and “We’re all Made of Stars,” sung by the Llewelyn Davies children. Lynnfield’s Christina Dwyer gives the part of widow Sylvia Llewelyn Davies an open heart and vulnerability, but also exhibits a steely spine when her own illness threatens to split the family. As Barrie, Billy Harrigan Tighe is a bit of a kid who won’t grow up, frustrating for his wife Mary (Kristine Reese), who is happy to be the wife of a prominent writer but not all that pleased with his quirks. As expected, the four Llewelyn Davies boys in the are quite the charmers and quite a handful, and at a recent performance, the roles of the four brothers were performed by Connor Jameson Casey, Colin Wheeler, Turner Birthisel, and Tyler Patrick Hennessy. They each provide admirable performances, and they even get their chance to perform together in “We’re All Made of Stars.” Casey shines in the role of Peter, who feels deeply both the loss of his father and the impending loss of his mother, even as he struggles to find the writer within himself. He has a lot of fun in the role and the audience has a lot of fun along with him. Karen Murphy is just fine as Mrs. du Maurier, Sylvia’s skeptical mother wary of Barrie. There is creativity aplenty in the first act number ”The Dinner Party” in which Barrie, in his imagination, freezes the scene and dissects all those attending the party. Scott Pask’s scenic design often takes a back seat to Jon Driscoll’s projection designs, which uplift and inspire several scenes, especially the climactic moments. Mia Michaels’ choreography is interesting but there isn’t enough there to really make the production numbers soar. Acclaimed Director Diane Paulus has cast well and has a keen eye for what works, but there isn’t a heck of a lot she can do about a score that probably won’t stand the test of time. The Weinstein Live Entertainment and NETworks Presentations LLC production of “Finding Neverland.” Book by James Graham based on the Miramar motion picture and the Allan Knee play “The Man Who Was Peter Pan.” Music by Gary Barlow and Eliot Kennedy. Directed by Diane Paulus. Choreographed by Mia Michaels. At the Boston Opera House through Aug. 20. broadwayinboston.com.